Have a question about college prospects? Email David Seifert at seifert@prepbaseballreport.com or tweet at him @dseifertD1PBR. Thanks for all the great questions this week. Please keep them coming. Who are the top 10 college prospects for this year’s draft? In no particular order, I would include hitters 2B/SS Nick Madrigal (Oregon State), SS Jeremy Eierman (Missouri State), CF Travis Swaggerty (South Alabama) and OF Griffin Conine (Duke). On the pitching side, lefties Ryan Rolison (Ole Miss) and Shane McClanahan (South Florida) are two of the top arms. Righthanded pitchers include Casey Mize (Auburn), Logan Gilbert (Stetson) and two from Florida: Brady Singer and Jackson Kowar. Others who are currently considered by the industry to have top 10 college prospect potential include lefthanded pitchers Tim Cate (Connecticut) and Konnor Pilkington (Mississippi State), as well as OF Greyson Jenista (Wichita State). Finally, a few favorites of the PBR/D1 Baseball prospect team include three outfielders: sophomore eligible Zach Watson (LSU), Steele Walker (Oklahoma) and Jameson Hannah (Dallas Baptist). We will release our updated PBR/D1 Baseball prospect rankings in early February. Who are your favorite potential “money saver” seniors who could go in the top 10 rounds? Let’s start by looking at the top unsigned college juniors from last year’s draft. To my count there are five who were taken in the top 20 rounds and did not sign. The highest drafted among them was RHP Cason Sherrod from Texas A&M in the 13th round by Kansas City. Others in the top 20 rounds include: RHP Luis Alvarado (Nebraska, 13th, SEA), C/UTL Matt Duce (Dallas Baptist, 14th, NYM), OF Josh McLain (NC State, 14th, LAD) and RHP Tyler Gray (Central Arkansas, 20th, MIN). Then add in SS Laine Huffman (Long Beach St, 25th, NYM), OF Brock Deatherage (NC State, 29th, PIT) and C/1B JJ Schwarz (Florida, 39th, TB), and many others who went undrafted: RHP Jake Walters (Alabama), RHP Jake Bird (UCLA), RHP Josh Green (Southeastern Louisiana), RHP Chase Beal (UL Monroe), SS Drew LaBounty (South Alabama), SS Kyle Kasser (Oregon), CF Zach Jancarski (Maryland), OF Devlin Granberg (Dallas Baptist), OF Colton Thomas (South Alabama), C/UTL Carson Shaddy (Arkansas), 1B Scott Schreiber (Nebraska), OF Logan Sowers (Indiana), OF Luke Bonfield (Arkansas) and LHP Jake Miednik (Florida Atlantic). This gives us a pretty good start identifying many of the potential top money saver senior prospects for the 2018 draft. Drew Rasmussen was the only college player drafted in the top 10 rounds who did not sign. Where does his draft stock stand for 2018? It’s safe to say he will not pitch this spring. It’s also safe to say he won’t be drafted in the first round again. After being selected 31st overall in 2017 by Tampa Bay, Rasmussen had Tommy John surgery. Typically, a pitcher with his talent who is fresh off TJ surgery is a potential second or third pick for a team with multiple early picks. This year, likely clubs would include Kansas City and Tampa Bay, who could potentially each have three or four extra picks within the top three rounds. However, this summer’s TJ surgery was Rasmussen’s second in less than two years. Although growing by the month, there is relatively little precedent at all levels of baseball for second TJ surgeries, let alone an amateur with two. The risk is just too great to draft him too high. He also turns 23 years old in July. With that said, Rasmussen has hard to find talent and I can see him being selected around the fifth round, once the deep talent of the 2018 draft has thinned out a bit. Who are the top college middle infielders in the upcoming draft? At this point, the top spot is a two-horse race between a couple of really good ones: Nick Madrigal (Oregon State) and Jeremy Eierman (Missouri State). Madrigal has the early lead as he is the most polished of the two. Madrigal is considered a “sure thing,” or as sure as they come, to become an everyday big leaguer. He has consistently performed at high levels against top amateur competition. He is the least risky of any prospect in this year’s draft. Historically, college position players have the least risk of any type of prospect (followed by high school hitters, college pitchers and the most risky, high school pitchers). However, Eierman has greater physical tools and a higher ceiling as a potential five-tool major leaguer. With another great season and improvement in his bat-to-ball skills, Eierman could jump Madrigal by June. 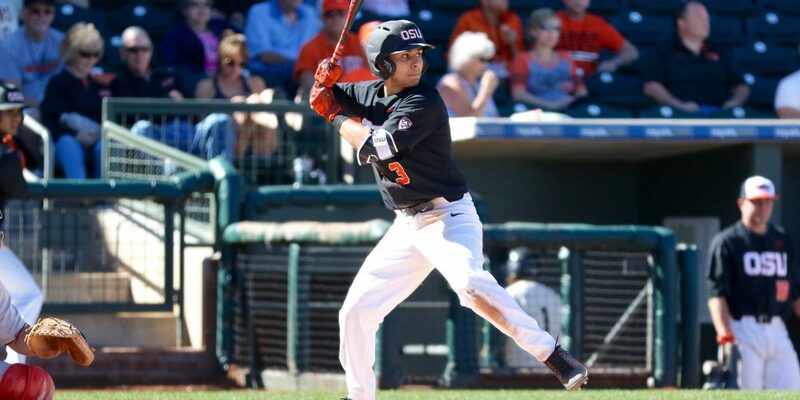 Oregon State also has another talented, potential top-round pick in SS Cadyn Grenier. Scouts are waiting for his performance to match his tools. The West Coast also has standout middle infield prospects in professional hitter SS Nico Hoerner (Stanford) and slick fielding SS AJ Graffanino (Washington). The middle of the country offers SS Owen Miller (Illinois State), SS Terrin Vavra (Minnesota), SS Jax Biggers (Arkansas), SS Connor Kaiser (Vanderbilt), 2B Ethan Paul (Vanderbilt), SS Trey Dawson (Kentucky) and SS Ford Proctor (Rice). Sweet-swinging 2B Nick Dunn (Maryland) and super utilityman Tyler Frank (Florida Atlantic) lead a thinner group in the east. Who is the guy you see having the best chance to get to the big leagues the quickest? Finally, a question with a short answer … Without a doubt, Nick Madrigal from Oregon State is the leader in this clubhouse. He has the skills, instincts and experience to move through the minor leagues quickly, similar to Alex Bregman or Dansby Swanson. Pitching-wise, a case could be made for righthanders Brady Singer (Florida) and Casey Mize (Auburn) or lefties Ryan Rolison (Ole Miss) and Tim Cate (UConn). All four have the present stuff and command needed for immediate success in professional baseball.